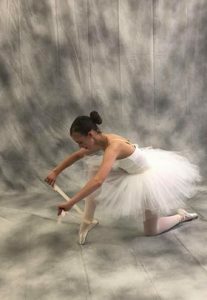 Avery’s Ballerina - Avery Biomedical Devices, Inc.
Elise has Congenital Central Hypoventilation Syndrome (CCHS). 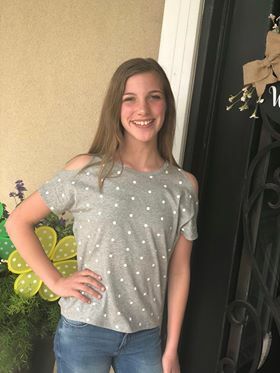 Shortly before her ninth birthday, Elise and her family were told by her doctor about the Avery Diaphragm Pacer because Elise would get at least two infections a year. Elise was implanted on November 14, 2012 at the Tulane University Hospital by Dr. Steiner. Six weeks after being implanted, Elise was pacing nine (9) hours a night. Elise was also able to have her trach removed six (6) weeks after her surgery and has been trach-free since. Elise is a very active and independent 14-year-old. She participates in Beta club, theater and musicals at her school. She recently went to a Beta convention with just her friends. This year she plans to attend summer camp with others who have respiratory issues. Since Elise has been a year old, her passion has been ballet. With the help of her Avery pacer, she is living her dream. The Avery Diaphragm Pacemaker is the only diaphragm pacing system to have full premarket approval (PMA) from the US FDA and CE Marking privileges under the European Active Implantable Medical Device Directive for adult and pediatric use. In addition, using small implanted radiofrequency receivers rather than electrode wires that pass directly through the skin may decrease a patient’s risk of infection and ongoing wound care management issues. Avery has been commercially distributing Diaphragm Pacemakers since the early 1970’s. Since then, more than 2,000 patients have been implanted in over 40 countries establishing an unsurpassed record of safety and reliability. Due to their high reliability and cost effectiveness, the Avery pacers are reimbursed by Medicare and most private and government insurance around the world. To learn more about the benefits of the Avery pacers for those with a high spinal cord injury, central sleep apnea or diaphragm paralysis, please contact us by mail, phone or through our website. CCHS is characterized by adequate ventilation while the patient is awake and by hypoventilation with shallow breathing during sleep. More severely affected patients hypoventilate when both awake and asleep. With CCHS, this is caused by the brain not utilizing the phrenic nerves (the neurological pathways between the brain and each hemidiaphragm, originating at the C3-C5 vertebrae) in a consistent manner. While this may cause a major difficulty in patients with CCHS, there may be an option to facilitate regular breathing with a diaphragm pacing system.